Concerns on trade, Italy, France, Germany, the Fed's hawkishness, and the NFP could send it lower. 1) Germany's CDU picks a new leader: Angela Merkel begins her slow retreat from the top of global politics as her party chooses her successor. If Annegret Kramp-Karrenbauer is chosen, we can expect the same centrist policies and Merkel staying in power for longer. But if the right-wing Merkel critic Friedrich Merz is chosen, he may force Merkel out and also end the coalition government. The disappointing drop in German Industrial Production is not encouraging either. 2) French protests have not ceased: President Emmanuel Macron gave in to the "gilets Jaunes" (yellow vests) demonstrations that resulted in his planned taxes on diesel. But after scrapping the plan, protests are still set to resume. 3) Italy is fighting with itself: The Italian government extended its climbdown from the high budget deficit after Brussels rejected it and threatened disciplinary action. However, now the two coalition partners are at odds about what programs should be cut out of the budget and at what scale. The neverending crisis in the euro zone's third-largest economy is not helping the common currency. 4) Brexit woes: UK PM Theresa May is considering delaying the vote on the Brexit deal, scheduled to December 11th. Uncertainty is already extremely high and could worsen. While the Pound is the primary mover on Brexit news, the Euro is also vulnerable. The postponement is currently denied, but UK politics are quite volatile. 5) Trade tensions have not abated: The arrest of Huawei's Meng Wangzhou is still causing tensions between the US and China, casting a shadow on trade talks. Stocks have recovered on optimism, partly coming from Trump, but China remains frustrated with the arrest. 6) Hawkish Fed: Federal Reserve Chair Jerome Powell made another public appearance and remained bullish on the economy. He said the labor market is doing well in "various ways." Did he hint of an upbeat jobs report? 7) Upbeat Non-Farm Payrolls: The US is projected to report job gains of around 200K in November, below the highs of October but still an optimistic number. Amazon's pay increases are also set to push wage growth higher. Will the NFP unleash a fresh round of USD strength? The technical picture for the world's most popular currency pair is decidedly mixed. The Relative Strength Index and Momentum are not going anywhere fast. The EUR/USD is trading just above the 200 Simple Moving Average on the four-hour chart, but not going anywhere fast. 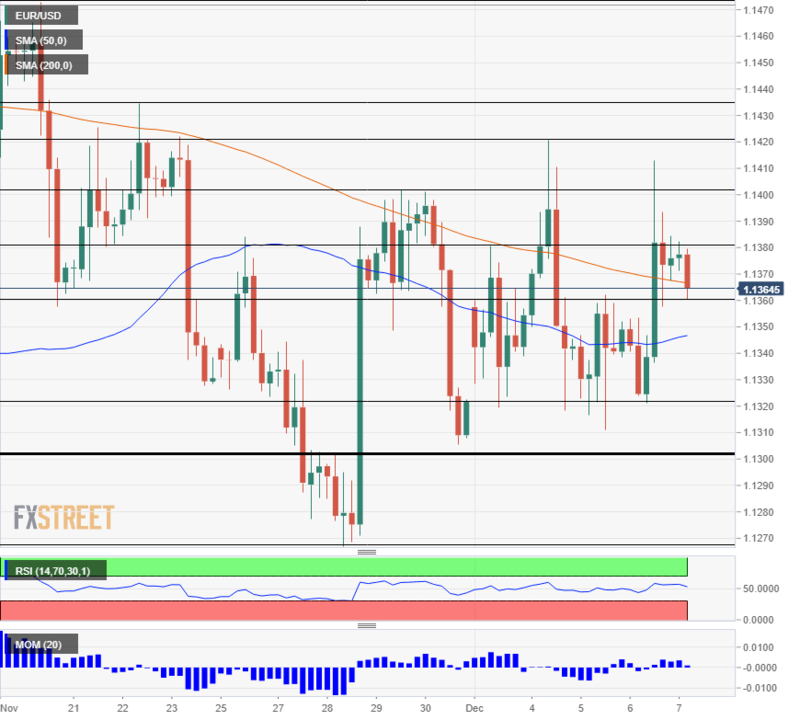 Support awaits at 1.1360 which provided support earlier in the day and served as both support and resistance in November. A more significant cushion is 1.1325 which was the gap line seen at the wake of the week, and it also provided some support on Thursday. The former double bottom and the round number of 1.1300 follows. Lower, 1.1270 and the 2018 trough of 1.1215 are noteworthy. 1.1380 is a minor line of resistance after working as a swing high early in the week. 1.1405 was a stubborn cap late in November. 1.1420 was the peak seen earlier this week. 1.1435 was \a peak beforehand. Further up, 1.1475 and 1.1500 are notable.